because of the very wet soaking in the canyon. But all is not lost and we have a lot to report on this week including one unscheduled observing practice session and plenty of indoor physicist wannabe activity. So, before getting to the one Algol practice observing session, I wanted to review the direction of time controversy, the latest release of top ten fails in astronomy (mostly amateur astronomy) and the online availability of a Python programming class. 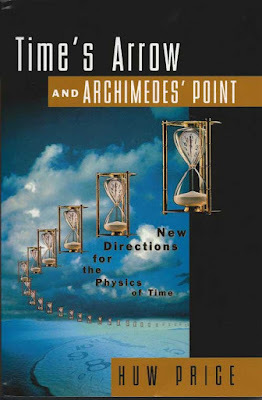 First up, remember the books I mentioned in the November 5 post that we had available on our recent Mediterranean cruise, one of which was "The physical basis of the direction of time", by Dieter Zeh. In the November 22 post, I mentioned the book that had the most pages read. Well as previously reported, I didn't make any progress on that book, but during the recent rain induced indoor activity, I had a chance to begin studying it. Well, I found it a little too difficult, essentially in its level of mathematics, so I opted to begin reading an easier book on the same topic. See the book cover below. Well, I've got through maybe a hundred pages and Price's book is little easier to read, but he takes along time to get going. Remember that the whole issue regarding the direction of time is that the laws of microphysics, such as quantum mechanics, and many laws of macrophysics, just consider that laws of motion of balls on a pool table, are valid for both positive time and negative time. Physicists say the laws are symmetric with respect to time. As most engineers know, many of the equations we would use daily have multiple solutions, one for positive time and one for negative time, and we just learn or are taught that we just throw away the negative time solution because it doesn't really apply. If you are shown a portion of a video of balls moving on a pool table it is often not clear how to tell if you are viewing the video in the forward direction or the reverse direction. The same with physical laws which are valid for positive and negative time. It's only when we consider longer portions of time, when the 2nd law of thermodynamics, and situations of life, birth and decay occur, that we are sure that time only moves in the positive direction. They both even use the example of waves moving out on a pond after a rock has been thrown in. We never see the opposite condition where waves move towards the center and end up throwing out a rock; it just never happens. 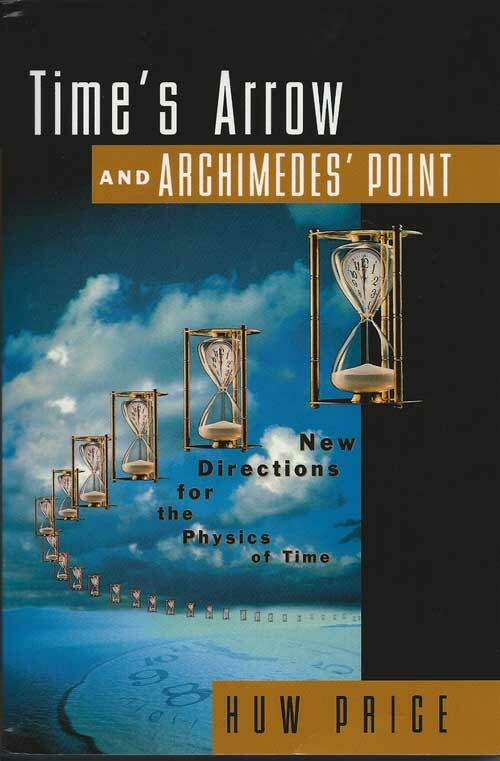 But Price and Zeh argue that we should not be so fast to dismiss the alternative view of negative time, after all if the laws of quantum physics are valid for both positive and negative time, and they don't care which way time moves, so where does this apparent time asymmetry in our observable world come from? My impression is that it comes about because of the very low entropy at the time of the big bang and we just naturally move in the direction of increasing entropy. But Price and Zeh again caution against going with the situation, which seems no natural to us, that we might be getting fooled. Who knows and how will we tell? For me, at least this topic forces me to review the laws of physics I am currently studying and asking that question, What happens if I use negative time in the equations? Anyway, we will see what happens in the next hundred pages. Where do you stand on this time direction issue? Thank you for that funny reference, Ken! 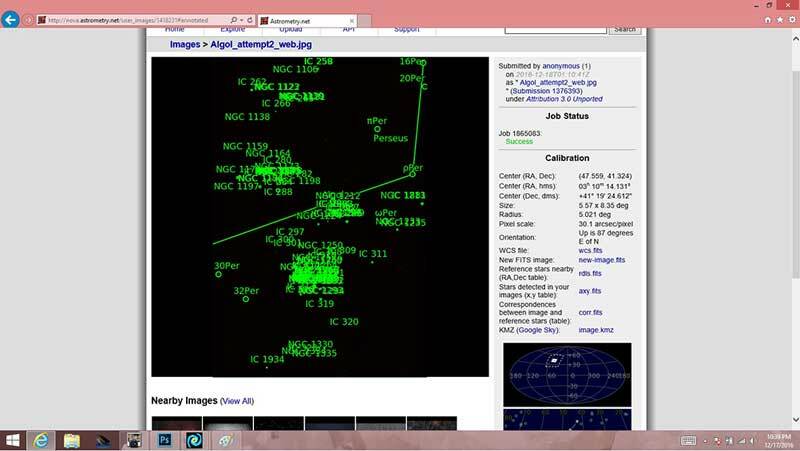 Finally, we can get to the latest photos and analysis gathered during the one clear evening last week. Remember that in the December 6 post, I described the recognition of a possible flaw in the observing plan. For my location in polluted city lights, I am not likely to be able to see and spot and move my camera to point at the dim Algol at magnitude 3.3. So, remember, because of this, I enlarged the camera field of view by using 150mm focal length rather than the previously set 600 mm focal length. The following photo shows the entire field of view for 150 mm telephoto lens. The field of view with this lens setting is 5.5 by 8.3 degrees.  Hopefully, this is large enough that any pointing error is small enough that the dim Algol is still in the camera frame. Since this image was taken using the old fashioned approach of star hopping from one recognized star to another until finally arriving at the target, Algol, the image was submitted to Astrometry.net and the screenshot below shows, yep, the camera was indeed pointing in the right direction. 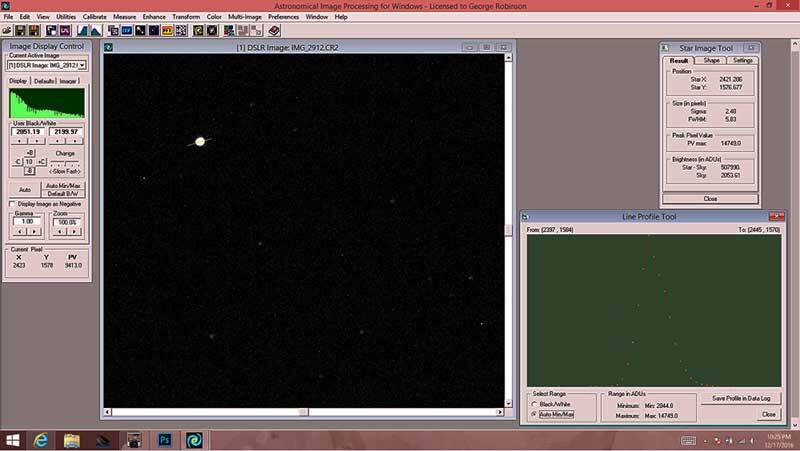 The other part of the observing plan that needed to be verified is what the proper exposure setting for 150 mm telephoto lens should be. My previous calculated estimate was that 2 seconds would be required, rather than the 1/2 second used for 600 mm lens setting. The AIP4WIN software analysis of Algol's image shows that 2 seconds is just a little bit to long. Note in the screenshot below that the light profile, along the chosen line going right through Algol, shows just one or two pixels with values of 14,749 counts. This value is just a bit too high and means the light curve measurement will be off due to the saturation at these levels. For a one second exposure, the maximum pixel count value should drop to about 1/2 that high value and this should be a good setting and even when the minima is captured there should still be enough pixel counts to get a good reading and sufficient signal to noise ratio. So, with the December 15 eclipse date overturned by rain, the next opportunity is December 18. But now I have found a discrepancy in when the eclipse will occur. My Sky and Telescope annual paper calendar lists the eclipse minima occurring at 8:20 pm PST, and the Sky and Telescope online eclipse calculator shows the minima to occur at 7:46 pm PST. Which one is the right time? 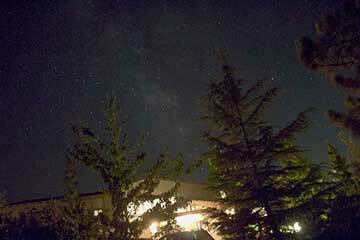 I don't know, so I fired off an email to Sky and Telescope magazine, but have not received an answer yet. 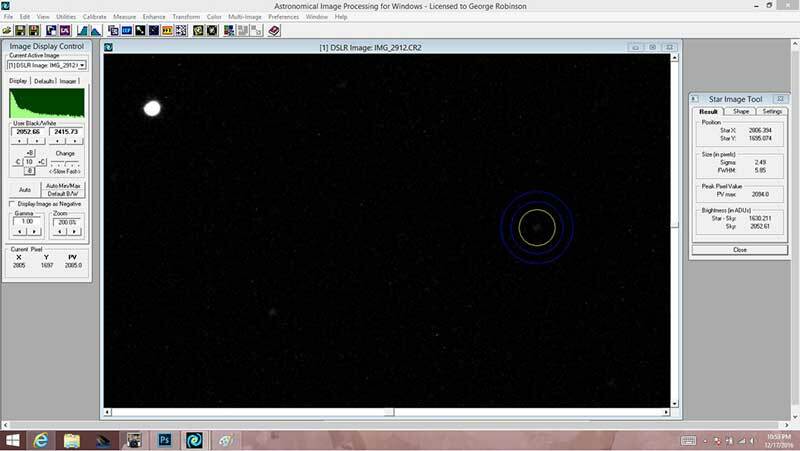 Maybe, if I am able to gather some measurements and can plot the light curve we will see exactly when the eclipse is at minima. The big difference for my observing plan is that I had always been planning to do this measurement at about 11:20 pm, which was the eclipse minima on December 15.  At the earlier time now, Algol will not be as high in the sky and my preferred observing location might not work. I think I will just have to move my site from the backyard patio to the front parking lot. I still prefer not to drive to some dark sky site because the total observing time is expected to cover 4-5 hours and I do prefer the comforts afforded here at the observatory. So, based on the above findings, the revised observing plan for the next Algol eclipse is to use 1 second exposure, instead of 2 seconds. The next eclipse is for Sunday (tonight), but unfortunately the weather forecast is for mostly clear but with winds between 23-33 miles per hour with gusty wind up to 53 mph. Wow, it doesn't look too good, but I will probably take a try at it anyway. If my tripod tips over, well, I guess it was just nature's way of saying I needed a new camera (and hey, its just before Christmas, perfect timing? ).